My mother made this dish a lot for my brother and me because it was inexpensive, easy to prepare and, most importantly, delicious. Growing up in southern Turkey in the city of Adana, we eat a lot of bulgur. Kurus is a very versatile dish, so we’re always searching for different ways to use it. Delicious served with yogurt and salad, and, just as well, it makes a great sandwich. Look for pomegranate molasses in Middle Eastern or specialty stores, or substitute lemon juice if you can’t find it. In a mixing bowl, combine the bulgur and the hot water. Mix well, and then cover with plastic wrap and set aside until the water has been absorbed, about 20 minutes. In a medium pot, cover the potatoes with cold water and season with salt. Bring to a boil, reduce the heat to medium and cook until tender, about 20 to 25 minutes. Drain the potatoes, grate them and then allow to cool at room temperature. Line a sheet pan with parchment paper. In a large mixing bowl, combine the plump bulgur, potatoes, Aleppo pepper, cumin, olive oil, flour, egg and 1 tablespoon salt. Mix until thoroughly incorporated. Divide the mixture into 20 pieces and form into 3-inch (8-cm) patties using the palm of your hand. Arrange on the sheet pan and refrigerate for at least 30 minutes, or up to 3 days. Meanwhile, make the spoon salad: in a medium mixing bowl, combine all of the ingredients, tasting the salad before you add the salt. When you are ready to cook the patties, place a large skillet over medium-high heat and add enough vegetable oil to cover the base by 2 inches (5 cm). Once the oil is hot (about 350° F/180° C), place the patties in the skillet and fry until golden brown and crispy, about 3 to 4 minutes per side. Transfer the cooked patties to a plate lined with paper towels and season with salt. Arrange the patties on a serving platter, and top with the spoon salad. Didem Hosgel was raised in a traditional Turkish family where cooking from scratch and preparing food for family members were ongoing and cherished practices. 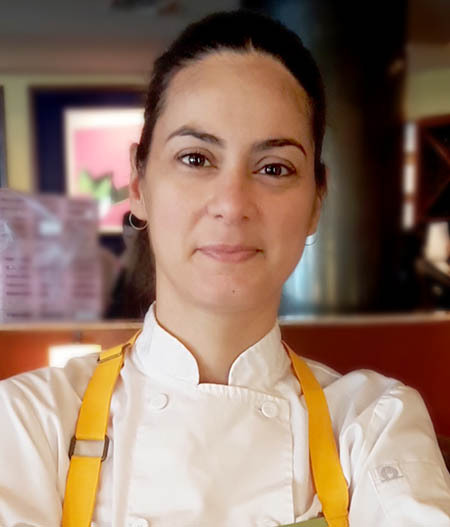 After moving to the us in 2001, Didem set her roots in Boston and began working for Chef Ana Sortun at the famed Oleana Restaurant in Cambridge, Massachusetts. After many years at Oleana, she became chef de cuisine at Sofra Bakery, a Middle Eastern-inspired bakery and café. At Sofra she creates innovative new dishes using fresh, local ingredients while still honoring her Turkish roots.